The field is still a seedling stand, considered as such until at least the first hay cutting (around the 6-9 leaf stage and a crown is forming). The plants in your stand are only 3-6 inches tall and you see some new, late germinating seedlings that you want to keep, perhaps delayed by the lack of rain and long, dry, cold spell last winter. The field is not Roundup Ready and you're looking for some post-emergent herbicide options. What should you use? What are the options? The most commonly used herbicides in seedling alfalfa are Raptor, Pursuit, 2,4-DB, and Buctril. These herbicides are used alone or in tank-mix combinations depending on the weed species present. The selective grass herbicides Select Max or Poast are often used if grassy weeds are present. These grass herbicides can be used alone or in combination with the broadleaf herbicides mentioned above. The risk of crop injury may be increased with some tank mixes when adding an oil adjuvant in high temperatures. Size Matters. You notice that the weeds in your alfalfa stand are too big for 2,4-DB, Raptor, Pursuit, and Buctril (have to be 1-3-inches or less) and some of the alfalfa seedlings are too small for these herbicides (have to be at least at second trifoliate leaf). Buctril also needs to be applied when temperatures are below 80oF and the weather can easily fluctuate at this time of year. Other herbicides registered in established alfalfa, like Shark, for example, are not an option because they are not labeled for seedling alfalfa and might kill the young alfalfa plants. You also know you have to be extra careful to avoid spray drift of any herbicide used to susceptible crops like tomatoes, especially at this time of year with new crops being planted. What should you do? Patience, Grasshopper! "Maybe you should just wait" is what Farm Advisor emeritus Mick Canevari (UCCE San Joaquin County) suggests. 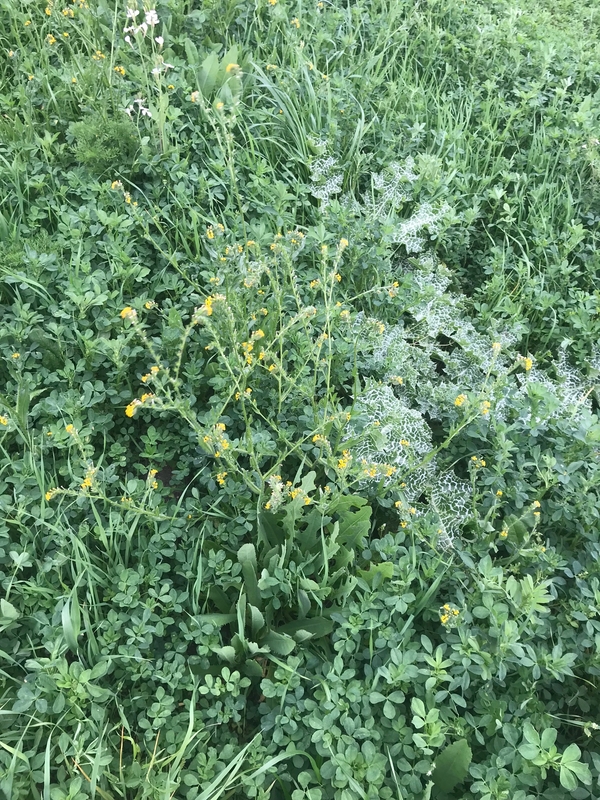 “Most of the weeds observed in the field are winter annuals, so they are on the downward slope and phasing out with warmer temperatures and longer days and now is just the perfect situation for alfalfa growth. The farmer needs to wait a couple weeks to let the alfalfa reach a safe stage for herbicide use, then see what things look like. It could well be that after the field is cut, baled, and irrigated it'll clean up and a weed control application will not be needed”. Harvesting weeds in the first cutting is not really the most desirable outcome, but may be the most cost-effective strategy if weeds are too advanced and the crop is close to harvest. Even if sprayed, large weeds are very likely to end up in the baled hay product anyway. Check out UC IPM Web Resources. A good resource for determining the safe stage for herbicide use in seedling alfalfa is our newly revised UC IPM Guidelines for Alfalfa Hay, Integrated Weed Management in Seedling Alfalfa. “Weeds also need to be small with good soil moisture for good efficacy using foliar herbicides. Weed size and low soil moisture is one consideration to look at when maybe you did not get the control you expected with these alfalfa seedling herbicides," adds Mick Canevari. What if the stand is not up to snuff? These same tough questions can occur when the seedling alfalfa stand is not adequate. It may be possible to 'overseed' to try to enhance a poor alfalfa stand, as discussed in an earlier blog, Managing marginal seedling alfalfa stands: What to do when it didn't quite work??. You have winter weeds and both older and younger seedlings out there. While overseeding in the Sacramento and San Joaquin Valleys are best done earlier than April, it could be considered after the first harvest. Again, patience is the key, with waiting until you reach the minimum alfalfa growth stage for that decision. Early Planting, Stand Establishment is Key. Overall, proper establishment and management of an alfalfa stand are essential for weed control. 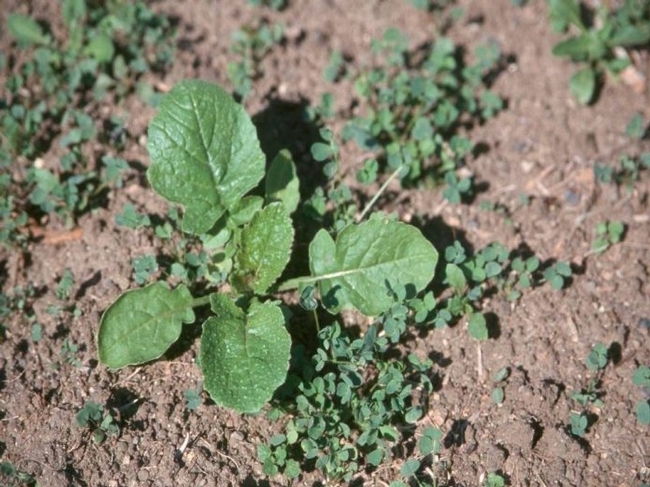 It is not cost-effective to control weeds in a thin or weak stand. Plant alfalfa at the right time (early fall) and depth; alfalfa that germinates and grows rapidly in response to warm temperatures, adequate soil moisture, and shallow planting (0.25 inch) will usually develop into a competitive stand with reduced weed problems throughout the stand life. Adequate soil preparation and soil fertility, especially phosphorus, is also essential in establishing and maintaining a vigorous stand. Plant only alfalfa varieties that are well adapted to your climate and soil type. Winter weeds in seedling alfalfa. While winter weed complexes make first harvest pretty ugly, the weeds may be too advanced for cost-effective herbicide control. Consider stage of alfalfa, crop injury, stage of weed, and the option of harvesting the mix, allowing alfalfa regrowth, and waiting.